FAO estimates the number of undernourished people in the world in 2000-02 at 852 million: 815 million in the developing countries, 28 million in the countries in transition and 9 million in the developed market economies (Figure 37). More than half of the total number of undernourished, 61 percent, are found in Asia and the Pacific, followed by sub-Saharan Africa, which accounts for 24 percent of the total. 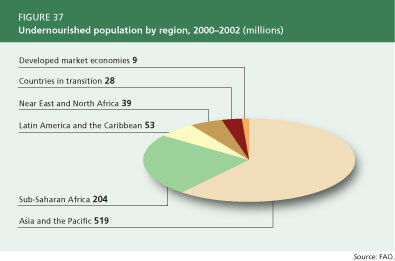 The proportion of the population that is undernourished varies among the different developing country regions. The highest prevalence of undernourishment is found in sub-Saharan Africa, where FAO estimates that 33 percent of the population is undernourished. This is well above the 16 percent undernourished estimated for Asia and the Pacific and 10 percent estimated for both Latin America and the Caribbean and the Near East and North Africa. 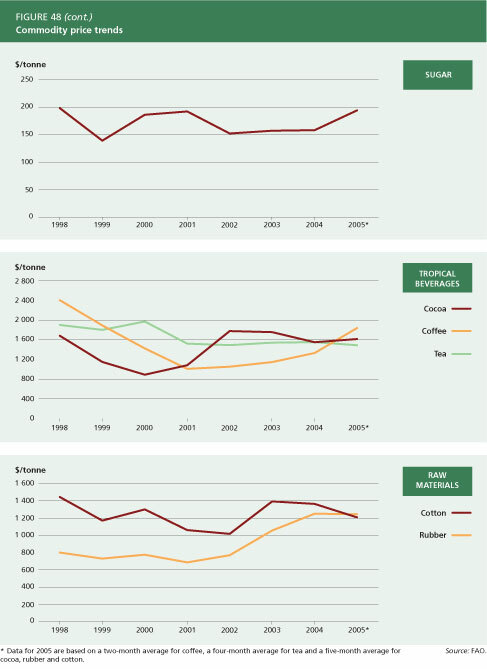 At the global level, the long-term trends for many food security indicators have been positive. The world total calorie supply per person has grown by 19 percent since the mid-1960s to reach 2 804 kcal/person/day in 2002, with the developing country average expanding by more than 30 percent. As consumption has increased, diets have shifted towards more meat, milk, eggs, vegetables and oils and away from basic cereals. The number of undernourished people has declined over the long run, although progress has slowed in recent years (Figure 38). The prevalence of undernourishment in developing countries fell from 37 percent of the total population in 1969-71 to 17 percent in 2000-02 (Figure 39). However, due to population growth, the decline in absolute numbers of undernourished people has been slower than that of the prevalence of undernourishment. Past progress in aggregate food consumption numbers and undernourishment indicators for the developing countries was influenced decisively by the significant gains made in the most populous countries, including Brazil, China, India, Indonesia, Nigeria and Pakistan. Most of the improvement in undernourishment figures over the past three decades has been concentrated in Asia and the Pacific, where the prevalence of undernourishment has been reduced by almost two-thirds. In sub-Saharan Africa, the extremely limited reduction in the prevalence of undernourishment has been more than counterbalanced by population growth, resulting in a large increase in absolute numbers of undernourished people. Latin America and the Caribbean experienced a significant decrease in both prevalence and absolute numbers in the 1970s, but has made little progress since then. In the Near East and North Africa, the prevalence of undernourishment fell significantly in the 1970s, but by 2000-02 it stood at slightly above the level of two decades earlier, after having actually increased over the 1990s. As of February 2005, the number of countries facing serious food shortages throughout the world stood at 36, of which 23 were in Africa, 7 in Asia and the Near East, 5 in Latin America and 1 in Europe. The causes are varied but civil strife and adverse weather predominate. A recent outbreak of desert locusts in western Africa and the tsunami disaster in South Asia have had serious though localized food security consequences. In many of these countries, the HIV/AIDS pandemic is a major contributing factor. Civil strife and the existence of internally displaced people or refugees were responsible for more than half of the reported food emergencies in Africa as of February 2005. The proportion of food emergencies that can be considered human-induced has increased over time. Indeed, conflict and economic failures were cited as the main cause of more than 35 percent of food emergencies between 1992 and 2004, compared with around 15 percent in the period 1986-91. In many cases, natural disasters are compounded by human-induced disasters, leading to prolonged and complex emergencies. The recurrence and persistence of emergencies often intensify the severity of their impact. In the period 1986-2004, 33 countries experienced food emergencies during more than half of the years. Many conflict-induced complex emergencies, in particular, persist to the extent that they develop into long-term crises. No fewer than eight countries suffered emergencies during 15 or more years within this period; in all instances, war or civil strife was a major contributory factor. In contrast, many countries that possess relatively stable economies and governments but are consistently affected by unfavourable weather have implemented crisis prevention and mitigation programmes and established effective channels for relief and rehabilitation efforts. For these countries, a natural disaster need not result in a prolonged humanitarian crisis. Food aid in cereals fell to 7.4 million tonnes in 2003/04 (June to July), 1.8 million tonnes (or 20 percent) below the level for 2002/03. 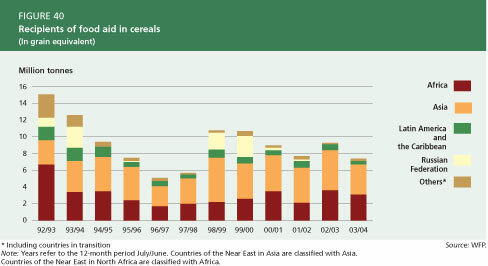 The sharpest decrease occurred in Asia, with shipments falling from 4.8 to 3.6 million tonnes - a decline of 25 percent. 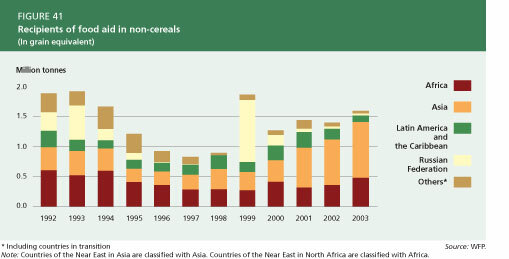 Other types of food aid increased slightly in 2004, but remain much smaller than cereal food aid (Figures 40 and 41).The top five recipients of cereal food aid in 2003/04, ranked in terms of volume of shipments, were Iraq, Ethiopia, the Democratic People's Republic of Korea, Zimbabwe and Bangladesh. All of these countries, except Zimbabwe, also counted among the top five food aid recipients during the previous year. Cereal food aid has been characterized by relatively large annual fluctuations. It has tended to decline relative to the levels of the late 1980s and early 1990s, but remains significantly higher than during the mid-1990s. Also in per capita terms, shipments have declined substantially relative to the early 1990s (Table 15). Disregarding exceptionally large shipments to the Russian Federation in certain years, Africa remains the largest recipient in per capita terms, albeit at levels well below those of a decade ago. The FAO Principles of Surplus Disposal and Consultative Obligations, originally agreed in 1957 and enshrined in the WTO Agreement on Agriculture disciplines on export subsidies in 1995, are intended to limit the potential of food aid to disrupt normal trade flows. Food aid may be further disciplined in the ongoing Doha Round of trade negotiations. The WTO Members have agreed to eliminate by a fixed date food aid that is not in compliance with operationally effective disciplines. The role of international organizations with regard to the provision of food aid by Members, including related humanitarian and developmental issues, are being addressed in the negotiations, as is the question of providing food aid exclusively and fully in grant form (WTO, 2004b: para. 18). Note: Years refer to the 12-month period July/June. Countries of the Near East in Asia are classified with Asia; countries of the Near East in North Africa are classified with Africa. Measured in constant 2000 prices, preliminary data for 2002 indicate that total external assistance to agriculture was virtually unchanged from the previous two years (Figure 42). The global picture, however, masks shifts among the regions. Latin America and the Caribbean and the transition countries experienced variability in recent years while assistance to Asia continues to decline. External assistance to sub-Saharan Africa is estimated to expand for the third consecutive year, rising from $2.8 billion in 2001 to $3.4 billion in 2002. 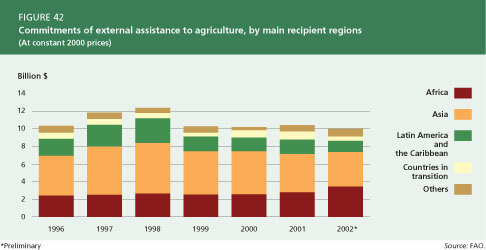 When measured in terms of amount per agricultural worker, external assistance to agriculture has more than halved since the peak level in 1982 (Figure 43). Among the developing country regions, sub-Saharan Africa seems to have recovered from the declining trend of the past two decades, with $17 of external assistance per agricultural worker in 2002. A possible slight increase in the 2002 values for the Near East and North Africa and Latin America and the Caribbean cannot be confirmed until final data become available. 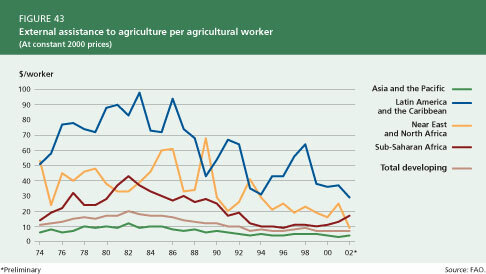 The amount of assistance per agricultural worker in Asia and the Pacific remains below that of other regions. Global crop and livestock production increased over the past two years at rates above the averages of the previous four decades. The higher global agricultural output growth in 2003 and 2004 is the result of an upsurge in production in developing and developed countries, respectively. 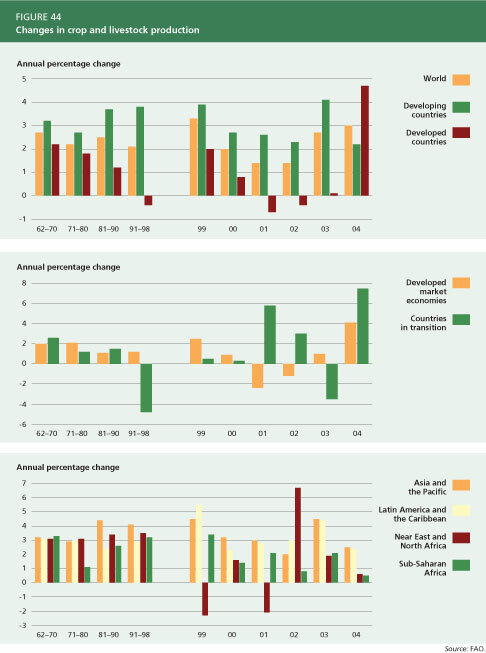 For the developing countries as a group, output growth peaked in 2003, but decreased in the following year to values below the averages of the previous decades. The developed country group recorded a significant output growth of almost 5 percent in 2004 after several years of contracting agricultural production. This rise is the result of a strong recovery in the transition countries and an increasing output growth in the developed market economies (Figure 44). 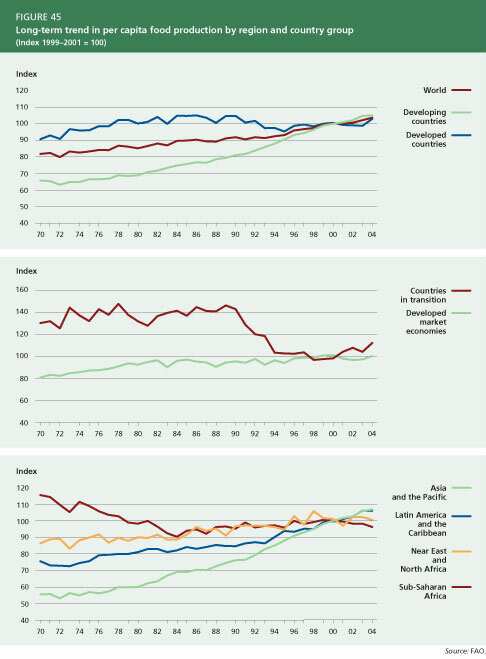 In all developing country regions, output growth was lower in 2004 than in 2003. In Asia and the Pacific, agricultural performance improved in 2003, expanding by 4.5 percent after the lower 2 percent recorded in 2002. The rate of agricultural output growth in the region nevertheless declined in 2004 to 2.5 percent. Latin America and the Caribbean experienced systematically increasing rates of production growth over the period 2000-03, which slowed down to 2.4 percent in 2004. In the Near East and North Africa, agricultural performance continues to be characterized by pronounced fluctuations caused by variable climatic conditions in many countries in the region. 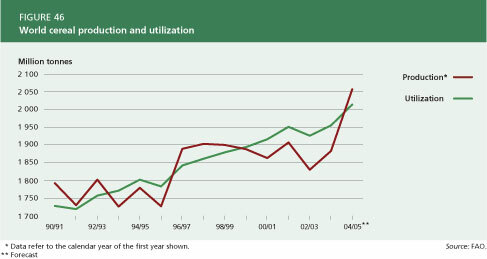 After increasing by almost 7 percent in 2002, output growth will be virtually stagnant for 2004. 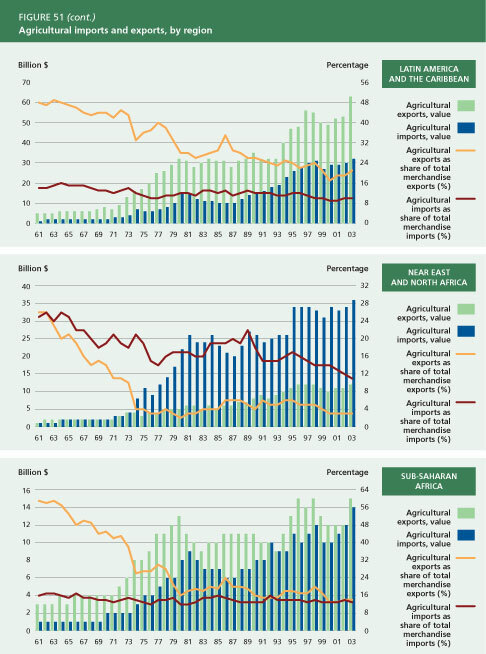 Sub-Saharan Africa has likewise recorded variable growth in agricultural output over recent years compared with relatively favourable rates during most of the 1990s. Data for 2004 indicate an increase of only 0.5 percent in the region's overall agricultural production. Long-term trends in per capita food production provide an indication of the contribution of the sector to food supplies (Figure 45). Global per capita food production has increased steadily over the past 30 years, with an average annual growth rate reaching 1.2 percent during the past decade. Both the developing and developed country groups shared in this expansion, with per capita production growing at higher rates in the developing countries vis-à-vis the developed countries. After several years of stagnation, global cereal production increased sharply in 2003/04 and is forecast to reach a record 2 057 million tonnes in 2004/05, up 9.2 percent from the previous year. With this level of production, even after allowing for an expected increase in global cereal utilization in 2004/05, a significant surplus is expected for the first time since 1999/2000 (Figure 46). This implies that global cereal reserves should increase by the end of the 2004/05 seasons - a positive development for world food security after sharp drawdowns during the past four years. 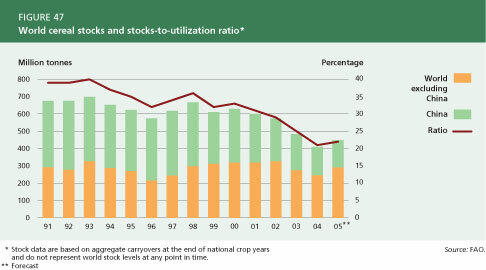 World cereal stocks are forecast to rise to 450 million tonnes at the close of crop seasons ending in 2005 (Figure 47). This expected accrual in world cereal reserves is noteworthy in that it represents the first such expansion in several years. The bulk of the accumulation is likely to occur where production prospects have been most favourable, especially in the EU and the United States. Even in China, the country responsible for the bulk of the depletion of global inventories over the past few years, only a relatively marginal decline is expected this year following the good 2004 harvest. The global stocks-to-utilization ratio is forecast to reach 22 percent in 2005. In 2004, prices of basic food commodities reached their highest levels since the mid-1990s (Figure 48). Prices of oils and fats have led this trend, rising by 63 percent from the depressed levels of 2000 and 2001. Other basic food prices, including those for cereals, meat and dairy, have also risen, although by smaller margins. Price increases in the oilseeds sector reflect continuing strong demand growth for oils for food use and meals for animal feed. The current high level of prices is stimulating farmers to increase plantings, and - assuming weather conditions remain good and pest incidence low - an expected expansion in production in 2004/05 could dampen the upward trend in prices. Cereal prices rose by 29 percent between 2000 and 2004. Despite much lower stocks than have prevailed historically, prices moderated somewhat in mid-year on the basis of favourable harvests. International meat prices increased in 2003 and 2004 as animal disease outbreaks in major meat-exporting countries and resulting bans on imports from these areas reduced exportable supplies. Poultry and pig meat prices moderated somewhat in 2004, but bovine meat prices continued to surge as disease problems and higher feed prices depress output and trade prospects. In contrast with the rising prices of basic food commodities, the price situation for tropical products and raw materials is mixed. The preliminary FAO forecast for the world sugar market in 2005 indicates that world sugar consumption could slightly surpass global production for the second consecutive year. The expected shortfall in global output would lead to falling stocks in major importing countries, underpinning the continued strengthening in market prices. Significant oversupply and sluggish demand growth in the world market resulted in coffee prices falling by 58 percent between 1998 and 2001. Prices have remained weak since then and, although some rises occurred in the interim period, it was only in February 2005 that prices actually reached the same level as the 1999 average. Preliminary returns point to a similar crop size in 2004/2005 as that harvested in 2003/04 and a continued upward trend in prices. After falling almost by 50 percent between 1998 and 2000, cocoa prices recovered strongly in 2002 and 2003, largely on the basis of disease-reduced harvests. Prices decreased slightly in 2004, but recent difficulties with shipments from West Africa led to a slight strengthening in February 2005. Cotton prices declined in late 2004 as a result of record output in the major cotton-producing countries (Brazil, China, India, Pakistan and the United States - which together account for more than 70 percent of world production). World cotton prices were recovering in the first three months of 2005, mostly due to expectations of lower production in 2005/06 following reduced plantings in response to low prices at sowing time. Rubber prices also recovered in 2003 and 2004 from the extremely low levels that prevailed during previous years as a result of stronger economic growth and higher prices for petroleum-based synthetic rubber. Weak and volatile prices, especially for beverages and other tropical products, have negative effects on the ability of many developing countries to generate export earnings. These effects can be particularly severe for countries that rely on exports of a small number of agricultural commodities for a large share of their export revenues, as do many developing countries. Forty-three developing countries depend on a single agricultural commodity for over 20 percent of their total export revenues and over 50 percent of their agricultural export revenues. Most of these countries are in Latin America and the Caribbean or sub-Saharan Africa. The most important export commodities for these countries are coffee, bananas, cotton lint and cocoa beans. The high dependence on only a few export commodities makes the overall economies of these countries extremely vulnerable to adverse changes in market conditions. Large fluctuations in export proceeds are likely to have negative impacts on income, investment, employment and growth. 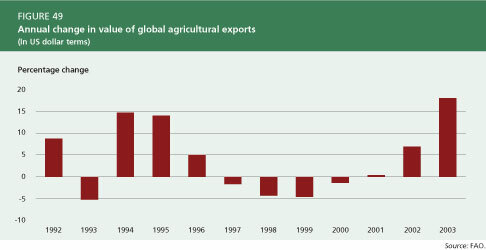 After declining for several years, the value of global agricultural exports expanded from 2001 onwards and reached a record value in 2003 (Figure 49). The share of agricultural trade in total merchandise trade continued a long-term downward trend throughout the 1990s, as agricultural trade has expanded more moderately than trade of manufactured goods. The recent upturn in agricultural exports has stabilized agriculture's share of total merchandise trade at 7 percent, compared with around 25 percent in the early 1960s (Figure 50). For the developing countries, the share of agricultural exports in total merchandise exports has dropped from almost 50 percent in the early 1960s to only 7 percent in 2003. This decline reflects both a diversification of their trade towards manufactured goods and the relatively slow growth of agricultural trade. 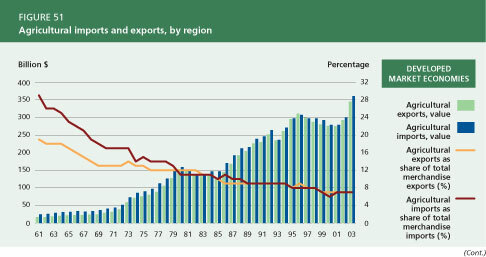 Until the early 1990s, the developing countries recorded an agricultural trade surplus in most years. 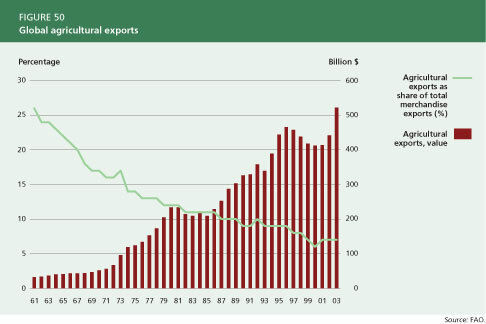 This traditional surplus position has been shrinking over time, and throughout most of the 1990s agricultural exports and imports in the developing countries were roughly in balance, turning to a trade deficit in 1999 (Figure 51). FAO's outlook to 2030 suggests that, as a group, the developing countries will become net agricultural importers and projects a developing country agricultural trade deficit of $18 billion (in 1997/99 US dollar terms) in 2015, rising to $35 billion in 2030 (FAO, 2002). Quite different agricultural trade positions are found in the different developing country regions. 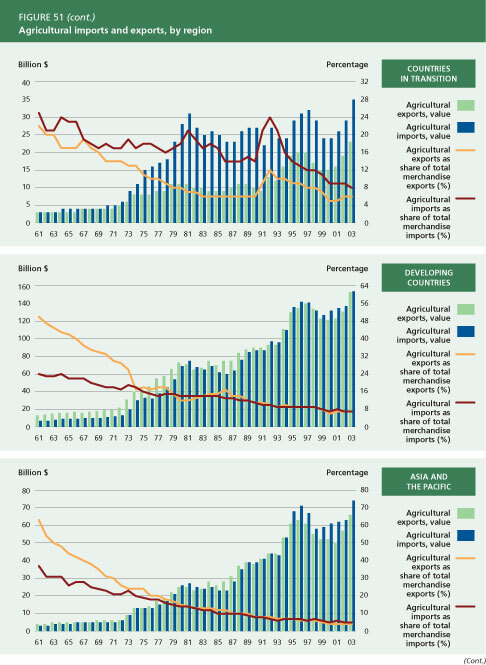 In particular, Latin America and the Caribbean region has seen a widening of its agricultural trade surplus, starting from around the mid-1990s. At the same time, Asia and the Pacific has become a net agricultural importer, while the significant structural deficit of the Near East and North Africa shows no signs of diminishing. isheries play an important role in the world food economy. More than 38 million fishers and fish farmers gain their livelihoods from capture fisheries and aquaculture. Globally, fish provide about 15 percent of animal proteins consumed, with variations from an average of 23 percent in Asia to approximately 18 percent in Africa and around 7 percent in Latin America and the Caribbean. Developments in the world supply of fish over the past decade have been dominated by trends in China, which has reported very strong growth in fish production, in particular from inland aquaculture, and has become the world's largest fish producer. Total world fisheries production in 2003 was 132.5 million tonnes, of which 42.3 million tonnes was from aquaculture (Figure 52). World capture fisheries production was 90.2 million tonnes, 3 percent below production in 2002. Most of the fluctuations in capture production in recent years have been the result of variations in catches of Peruvian anchoveta, which are driven by climatic conditions (i.e. the el Niño phenomenon). 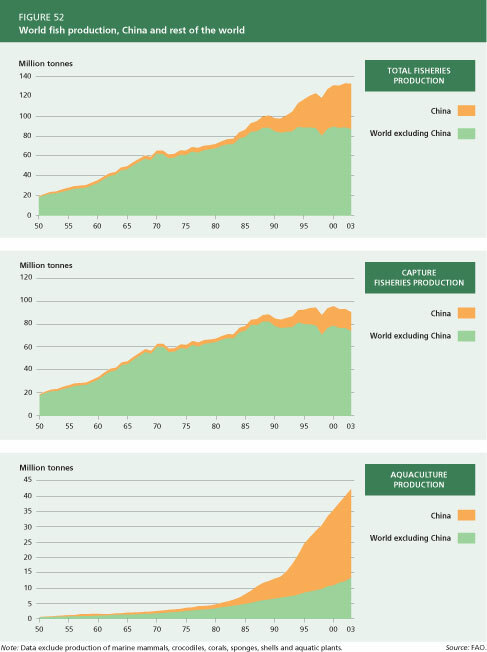 In 2003, China reported a production of 16.8 million tonnes, representing a slight increase compared with 2002. Peru (6.1 million tonnes), the United States (4.9 million tonnes), Indonesia (4.7 million tonnes) and Japan (4.6 million tonnes) were other large producers. 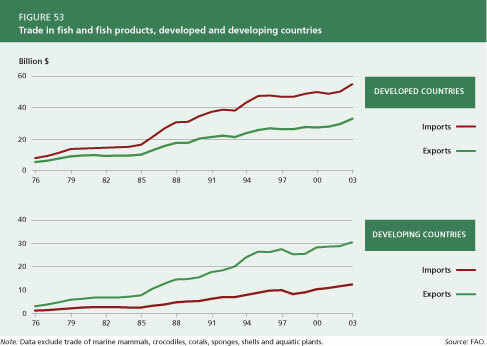 World aquaculture production has been increasing rapidly in recent years and now accounts for 32 percent of total fisheries production (Figure 52). Most of the expansion has been attributable to China, which is now responsible for more than two-thirds of total aquaculture production in volume terms (28.9 million tonnes in 2003). About 40 percent (live-weight equivalent) of world fisheries production enters international trade, with a value approaching $63 billion in 2003. Developing countries contributed slightly less than 50 percent of such exports, with the first ten exporters accounting for two-thirds of the developing country total. The developed countries absorbed more than 80 percent of total world fisheries imports in value terms (Figure 53), with Japan and the United States together accounting for as much as 36 percent of the total. The importance of fisheries exports as a foreign currency earner for developing countries has increased significantly. 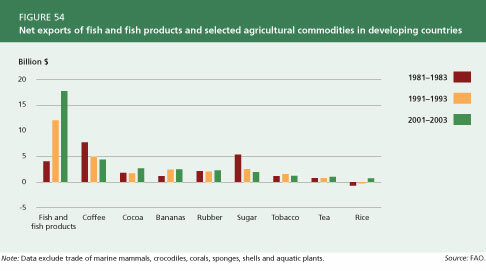 Currently, cumulated net exports of fish and fish products from developing countries far exceed export earnings from major commodities such as coffee, bananas, and rubber (Figure 54). World roundwood production in 2003 reached 3 342 million cubic metres, about 1.2 percent above the level of the preceding year (Figure 55). The greater part of global wood production is burned as fuel. 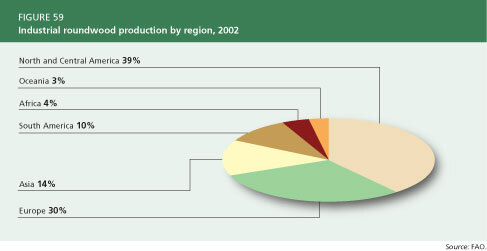 Of total roundwood production in 2003, 53 percent was woodfuel and the remaining 47 percent industrial roundwood. The vast majority of wood burning occurs in developing countries, where wood is often the most important source of energy. On the other hand, the larger part of industrial roundwood production continues to be accounted for by the developed countries, which provide more than 70 percent of the total. As most industrial roundwood is consumed and processed domestically, the proportion reaching international markets is small (Figure 56). The developing countries accounted for 2 000 million cubic metres, or 60 percent, of total roundwood production in 2002 (Figure 57). 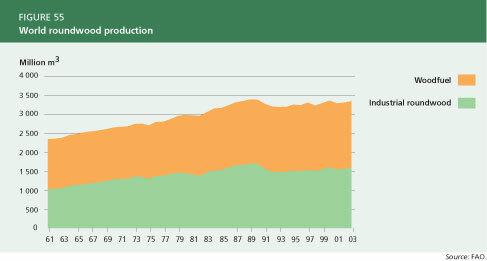 Almost 80 percent of roundwood production consists of woodfuel, the production of which has been stable in recent years. Developing country production of industrial roundwood has started to rise slowly after some years of decline. Total roundwood production in the developed countries, following a significant decline in the early 1990s, is still well below the peak levels of 1989-90. Industrial roundwood accounts for 87 percent of production, whereas woodfuel is of relatively marginal importance. The value of international trade in forest products increased rapidly from the mid-1980s to the mid-1990s to reach $155 billion in 2003. 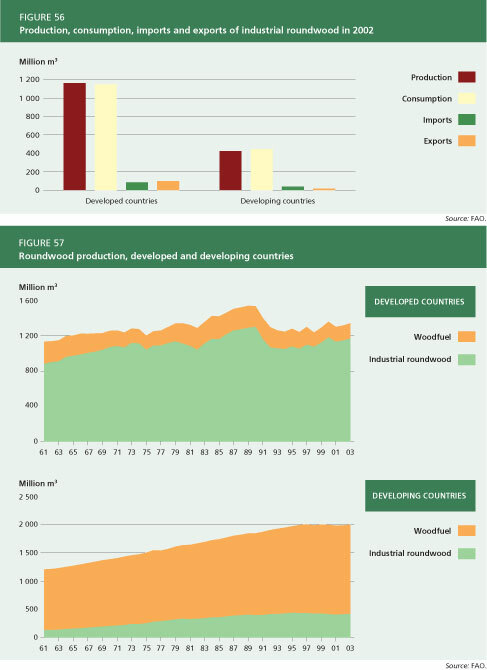 Europe, Asia and North and Central America account for the major share of the value of world forest product imports. In 2003, imports of forest products reached a maximum value of $76 billion in Europe and $43 billion in Asia, the second-largest importing region (Figure 58). 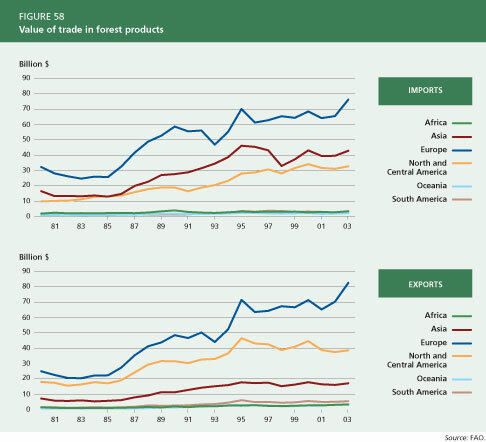 Exports of forest products increased remarkably in Europe in recent years and topped at $83 billion in 2003, accounting for more than half of the world's total forest product exports. The second-largest exporting region is North and Central America, although trends there are on the decline (Figure 58). Europe earns higher trade value both within and outside the region because many countries manufacture value-added products. The region accounts for 55 percent of world export value, although its roundwood production rests at only 30 percent of the world total. Countries in South America, Africa and Oceania mainly trade in raw material, earning 4, 2 and 2 percent, respectively, of world export value while accounting for 10, 4 and 3 percent of total roundwood production (Figure 59).